Jean-Claude Flornoy was a cartier-enlumineur and artisan d'art who has devoted 20 years to the study of tarot. In 1996 he undertook the restoration of the tarot of Nicolas Conver (Marseille, 1760), painting each arcane on giant canvases (220 cm by 110 cm). His aim was to faithfully bring this traditional imagery back to (larger than) life in all its original freshness. He then progressed to large-sized versions of other historic tarots derived from originals preserved in the Bibliotheque Nationale in Paris: Jean Noblet (Paris, c. 1650), Jean Dodal (Lyon, 1701) and a number of trumps from Jacques ViÈville (Paris, c. 1650). It was in spending the necessary weeks on each outsized arcane that he was able to come to 'understand' the way the images are operative in themselves. He regularly transported these large canvases for exhibitions, and proposes conference-workshops in a variety of tarot-related contexts. The next step was to publish, in traditional hand stencil-coloured versions, the 22 trumps of the tarots of Jean Noblet and of Jean Dodal. These were intended to correspond in every respect as closely as possible to what they resembled when new. In a step away from artisan productions, but moving old tarots closer to a wider audience, an industrial, Complete Jean Noblet Tarot, was published in June 2007. A new document has appeared with 8 Trionfi decks imported to Rome from a trader (or producer ?) Giovanni da Pistoia. If I didn't miscount, it's the 10th oldest Trionfi document. ... Playing card documents of Florence 1840. Some researches to the topic "Tarot de Paris", which according some specific details possibly should be dated 1559 instead of to "begin of 17th century" as usually. The relevant details are on the coins suit and are heraldic elements at all of the coins. .. which is "Gonzaga" (above) and "Strozzi" (below). In the year 1559 two young Italian men were active in the French army, one of them Ludovico Gonzaga (20 years old) and Filippo Strozzi (18 years old). Another heraldic at the 10 of coins has the personal shield of Henry II of France. He died in 1559 cause the wounds, which he got during a tournament. No other French king appears in the heraldic signs ... so it seems, that this dek shouldn't have been made after the death of Henry II. Also present with her heraldic was the lover of Henry II, Diane de Poitiers, at the 9 of coins. As the Queen Catherine de Medici didn't love Diane de Poutiers very much, it seems rather unlikely, that the deck would have been made later than 1559 with her signs. Between a few other notes there is also the information, that in the year 1630 existed Tarocchi decks in Sicily. Michael Dummett had always much attention on the Tarocco Siciliano, it was his favored object. From the earlier information it seemed to be given, that Tarocchi was invented to Sicily in the years 1662-63 by the current viceroy. 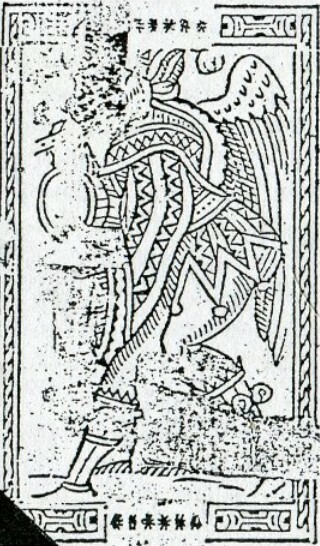 Inside the Sicilian article a woodcut block with 3x7 cards was shown at a rather small picture, which showed parts of a Tarocco Siciliano, given to 19th century. Strange enough, the picture got some attention at 27th of December. The deck proved to be rather similar to a deck in the WWPCM, there given as from 18th century. 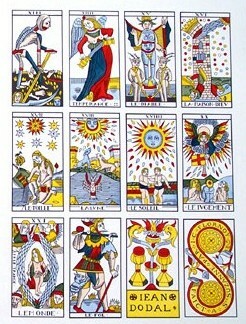 Both decks have the signifying "Jupiter with Ganymed" motif as highest trump, which is altered in younger Tarocco Siciliano versions to a "Jupiter with lightning". .. shows a figure with a wind instrument and a drum. Additionally it has at its back something, which can't be identified with security from this picture alone. The mentioned XVIII century WWPCM deck repeats the wind instrument, but the drum and the details at the back of the figure are nearly lost. However, a sheet found by the playing card researcher Peter Blaas in the Biblioteca Civica in Rovereto far away from Sicily in the North of Italy (considered to be older than 18th century) and reported by John Berry in the IPCS-journal XXI, p. 95 ff. (1993) has a Fool with wind instrument and drum and the insecure backside details are now clearly recognizable as wings. From Sicily it is known, that there was a stronger Minchiate influence, which was known there - as also in Genova - with the name "Gallerini". This went so far, that usual Tarocco Sicilano decks were occasionally addressed as "piccolo Gallerini" (little Gallerini; Dummett&McLeod: A History of Games played with the Tarot Pack, volume I, p.327). ... as the Fool in the Rovereto cards and the card is similar to the Fool in the XIX. century woodcut block version of the Tarocco Siciliano. It seems plausible to assume, that the "winged Fool", which as iconographic type is otherwise not known between the older Tarocchi Fools, together with it's companion, the "Miseria" or "Poverta" or "Beggar" in Tarocco Siciliano, developed from the contrast Matto and Fame in Minchiate (also called "Germini" or "Gallerini"). The Rovereto sheet include some pip cards, between them are 8s and 9s of swords and batons. The Sicilian XIX century woodcut block also contains these cards. The iconography of both decks is again rather similar regarding these cards. Some other cards of the Rovereto don't have these stronger similarities. The Rovereto Fool had wings and this is a rather rare iconographic detail between the older Fool cards. In the ideas about the Rovereto deck it was not believed, that it was a production near to Rovereto of Northern Italy, but it was considered somehow "from Rome" cause some details resemble the Colonna cards. * http://a.trionfi.eu/WWPCM/decks07/d05238/d05238.htm - XVIII century, "Tuzzolino"
* http://a.trionfi.eu/WWPCM/decks07/d05237/d05237.htm - XIX century, "La Fortuna"
* http://a.trionfi.eu/WWPCM/decks07/d05115/d05115.htm - reprint of "Carte de Etruria" c. 1725, by "Lo Scarabeo"
* http://a.trionfi.eu/WWPCM/decks07/d05113/d05113.htm - reprint of a Minchiate deck designed 1820 and printed 1865 by "Il Meneghello"
So, in memory of Michael Dummett, who reached a lot of merits in the small world of Tarot history, a Happy New Year (which just has reached Cologne with its fire crackers). Franco Pratesi has recently published various articles at Trionfi.com. Some of them are really VERY IMPORTANT for persons interested in 15th century Tarot research. The related objects are nearly all of recent research, written in the last 2-3 months. FLORENTINE CARD PRODUCTION IN ABOUT 1840 ? EARLY PLAYING CARD EXPORT FROM FLORENCE ?